This waterfront home features interior architecture and finishes designed to convey the feelings of a beach cottage but with a contemporary, refined twist. 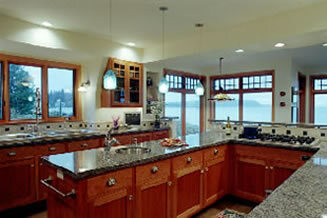 Cherry cabinetry and special trim pieces compliment the Douglas fir windows, doors and custom trim used throughout. Countertops include granite slab, limestone, and ceramic tile. 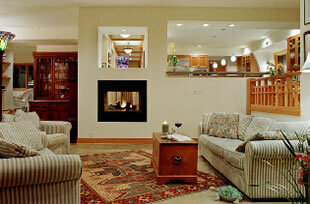 The light walnut color stained concrete floor runs throughout the main floor and is radiantly heated. 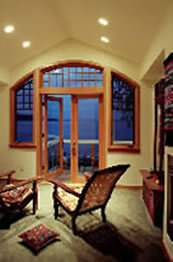 The Lindstrom’s antique stained glass furniture pieces were carefully integrated into the design.